October in the Lone Star State can only mean one thing for wine lovers: it’s finally Texas Wine Month. This annual fall affair celebrates the many local wineries between Houston and the Hill Country – it’s the time of year when the harvest is winding down and the weather is finally cool enough to enjoy an afternoon outdoors. Wineries across the state open their doors to passionate wine-tasters from all over, but this is as good an opportunity as ever to spotlight some of the best places in Round Top to get your wine on. 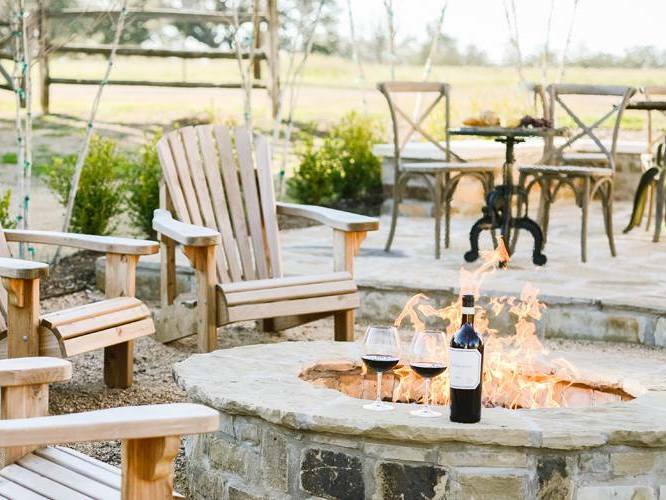 Located in Round Top’s historic Wandke House, Prost Wine Bar and Patio offers a sophisticated atmosphere where you can enjoy a casual evening of wine drinking on their back patio around the fire pit. Inside, you’ll find a cozy stone cottage with walls lined with wines from around the world. Artisanal cheeses, olive mixes, farm-to-table raw veggies and charcuterie boards make Prost a place for great food, quality wine and unforgettable memories. The Stone Cellar knows how to take a pub experience and put a Texas twist on it. Their rustic open-air concept invites customers to come and go as they please, and they offer a full wine list in addition to craft beers and pizza. Stop in for some live music, good conversation and a great place to un-wine-d.
We all know Lulu’s as the place in Round Top to get the best artisanal Italian food, but they also have a breathtaking world-class wine list. The rustic European setting will make you feel like you’re sitting in old-world Italy as you choose from their dizzying array of fine wines curated from all over the world. There’s even a private cellar for hosting wine dinners, wedding receptions and parties. If you’d like to venture beyond Round Top, there are plenty of local wineries outside the town that is big time small. Just down the road in La Grange, you can find the Rohan Meadery, a family-owned winery specializing in the production of artisanal wines made from Texas honey. In Burton, the Saddlehorn Winery boasts a tasting room in a renovated horse barn that overlooks rolling hills and scenic views. Round Top is holding its very own celebration of wine in November – a weekend of live music, exotic wines and great food. For more information on the 2018 Round Top Wine Fest, click here. Version 1.0 Suggestions for the site?